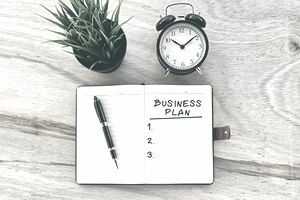 Now that you have read the article on why you need a business plan and the next article on your internal planning document, the business action plan, it's time to start putting together the formal business plan for your company. The first page or two of the business plan will be the Executive Summary and the Table of Contents. Those pages are written last because you don't really know what you want to say in the Executive Summary until you write the entire business plan and you can't write the Table of Contents until you finish the plan. Instead, we start with your Company Overview and your company's values statement. This, like every section of the business plan, will require some thought on your part. Thinking about the values that your company will operate under has a lot to do with your own values. You may think about the marketplace today, and it may seem like it is a scenario where survival of the fittest reigns and ethics and values don't matter anymore. The thing is, that's not true. If you don't deal with your customers ethically, they won't be your customers anymore. If you have investors and you don't deal with them ethically, they will drop you like a hot potato. Your employees, while they may seem desperate for jobs, they aren't "that" desperate. Treat them with respect and they will do the same for you. Business ethics and values may matter more than ever. People are looking for companies with values. Investors want to invest in socially responsible companies who can also make money for them. Customers are craving to buy from companies who employ U.S. workers and from whom they can buy U.S. products. Employees are looking for employers they can respect and earn their respect in return. There is the background for your corporate values statement. Lack of ethics on Wall Street led to the financial collapse of 2008, from which many segments of our markets still have not recovered. As a small business person, you will see this as you start up or grow your business. If your small business is accused of a lack of values and ethics, it could quite possibly never recover. Here is a scenario analysis to test your values. John Jones is a management consultant running his own small business. He has a client who has hired him to make a recommendation on a project they are contemplating introducing in another country. That country has virtually no pollution guidelines as we have in the U.S. This project involves drilling for oil and natural gas in the other country. Engineers have already determined that substantial pollution will be a consequence of the drilling. However, John Jones and the company he is working for has no idea if the drilling will be successful. It is a very risky project, but with possible high short-term profits if it is successful. Should John recommend the project? In the first place, if John recommends this project, he would likely be sacrificing long-term profitability and maximization of shareholder wealth for short-term profits, if the project is successful. Is that ethical? No. The goal of a firm in a capitalist society is ​the maximization of shareholder wealth. Second, even if a foreign country has no pollution guidelines, should a business owner who knows that dumping pollutants into a countries air and water is a terrible thing recommend it? No. That should be against their values. Most people would say that John Jones should definitely not recommend this project for both financial and ethical reasons. What is a values statement? A values statement is a set of beliefs and principles that guides your company as you do business. From a practical standpoint, it can keep your company on the right side of the law, and out of trouble with the IRS and other federal and state agencies. If a crisis strikes and your company has a values statement, everyone knows how to react and chaos is reduced to a minimum. Remember that your values statement will have an impact on all stakeholders of your firm from customers to investors. Building your values statement takes time. You can probably write down some of the values you want for your company right now. Others you may have to think about. Some will come to you as you write additional sections of your business plan. Don't rush. The values statement will build itself as you build your business plan. If you are working with a partner or even with a senior manager or two, sit down and brainstorm with them about the values you want your company to uphold. Look at examples of values statements for other companies and see what you can learn from them. Sybase, Inc. is a worldwide technology (SAP) company supplying enterprise management solutions to Fortune 500 companies. The CEO of Sybase has a very clear values statement on their website that might interest you and help you write your own. A smaller company, Whole Foods, the natural and organic food corporation, also has an interesting value statement on its website. Should You Use a Cash or Accrual Accounting System? What Do Retained Earnings Reveal?